I always love love love working with the Siler family. Not only are they absolutely a model family with those gorgeous babies, but they are so sweet! So you can imagine my excitement when Emily asked about maternity photos for her sister in law. 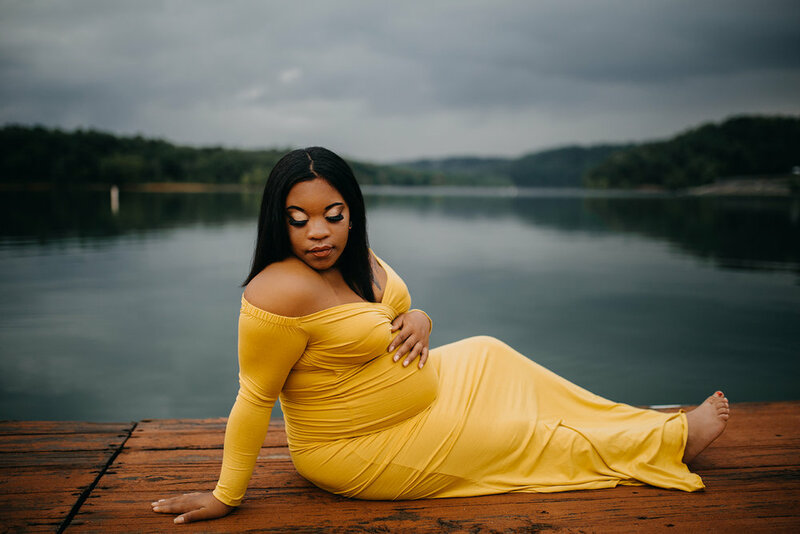 They found the most perfect maternity gown on Amazon for Bre, and it was the most gorgeous color for her complexion! We knew we wanted pretty lighting so we decided on a sunrise session. I had a wedding the day before and I didn’t get home until 12:30 am ish so I knew I was going to be in trouble when that 5:30 AM alarm went off the next morning. I did wake up however, but I fell BACK ASLEEP BY ACCIDENT! How many of you have done this? I felt absolutely terrible but thankfully I was able to hop out of bed, grab my camera bag and made it before the sun had risen completely. It ended up being really cloudy, so it worked out perfectly! Bre was absolutely gorgeous and Emily had woken up at 5:00 AM to do her hair and makeup. She said they had practiced the night before and it didn’t look as good but MAN, IT WAS BEAUTIFUL! She did SUCH a good job. Bre, I am so excited for you to meet that tiny human that lives in your tummy <3 Thanks for allowing me to document this huge milestone of your life.